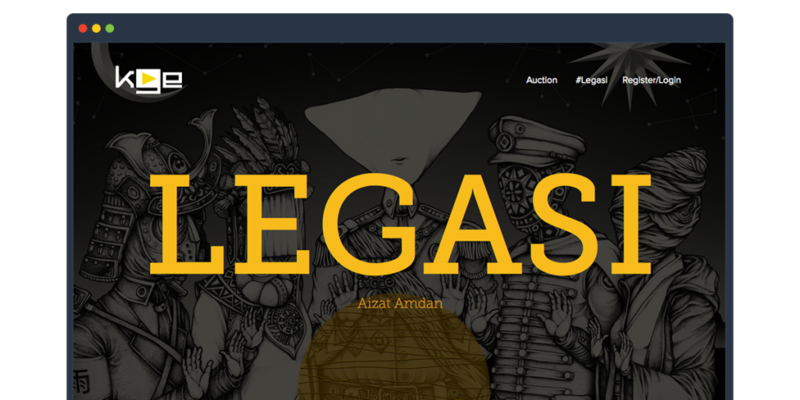 In conjunction with Aizat Amdan’s LEGASI album launch, its record label, Kasi Gegar Entertainment Sdn Bhd wanted to release the newly produced album by auctioning 222 limited edition vinyl boxset which included a vinyl, digital copy of the album and a unique serial number that is enclosed within a special black wooden box. 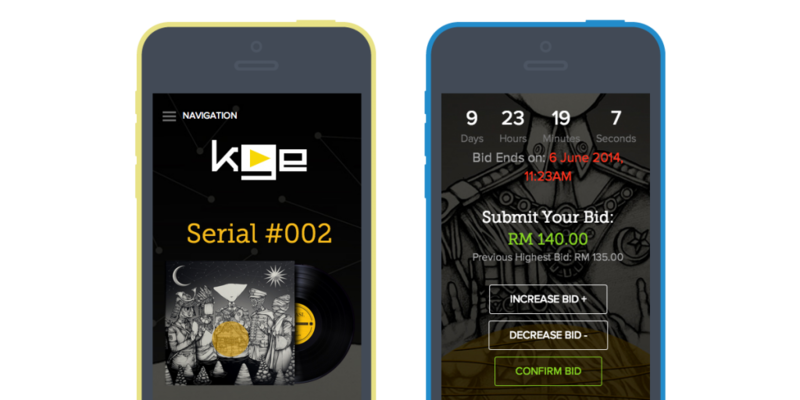 To achieve this, KGE wanted to have an online auction/bidding website which fans of Aizat Amdan could bid on their favourite numbered vinyl. The site has to be responsive and the bidding process has to be easy and intuitive enough for everything to run smoothly. With the limited amount of assets to work with, I decided to base the design around the cover album’s artwork and toyed with the limited colour scheme. 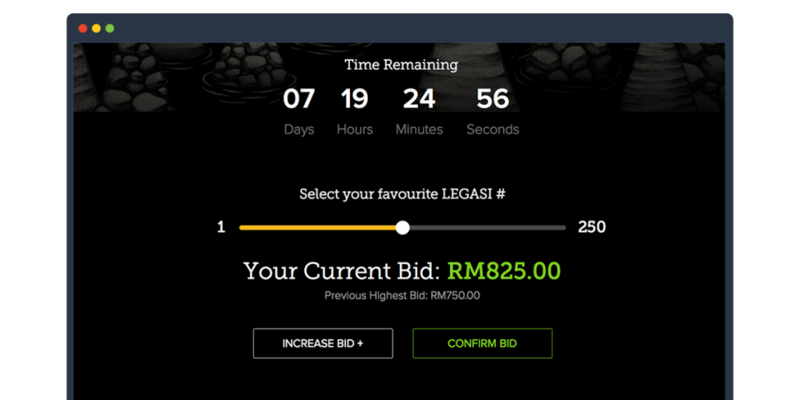 The homepage has a simple one page website kinda feel which highlights the most popular vinyls and what the winning bidder will receive when he/she wins the bid. The users are then lead to thel Call To Action, which requires them to start bidding. 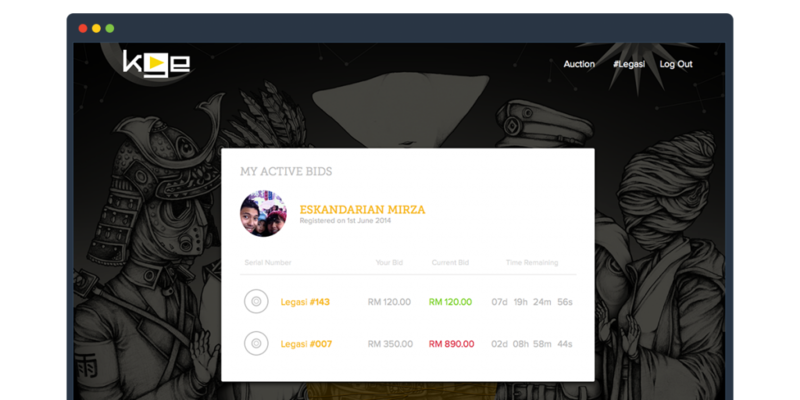 One of the challenges of designing the interface and user experience of the website is the bidding page. A normal product based ecommerce website would be able to list out all of the products in a grid like fashion, but since all of the images and description are the same, going down that route would make it monotonous and boring as well. With 222 of these vinyls up for grabs everything would seem so repetitive and unappealing. After a few trial and errors, I’ve decided to stick to a slider based UI which will refresh the serial number and bidding activities/details that would solve most of the problems I was facing. The Front-End development was pretty straightforward, but there were a couple of new jquery libraries that was used to enhance the overall experience. All of this was done within a week which was quite amazing and the whole team at Motive Interactive did a pretty awesome job!